Signing off and toasting: To a respectable process and respectable new food guide. You may or may not agree with every recommendation made in Canada’s Food Guide, but the way it was put together this time sure deserves some respect. There’s often a lot of skepticism towards national food guides by both health and nutrition professionals as well as the public. The history is fraught with industry lobby; not to mention that food guides have not done a whole heckuva lot to improve eating behaviour (people are eating more junk than before). Canada’s Food Guide was just re-issued this week and it’s unlike the previous versions. 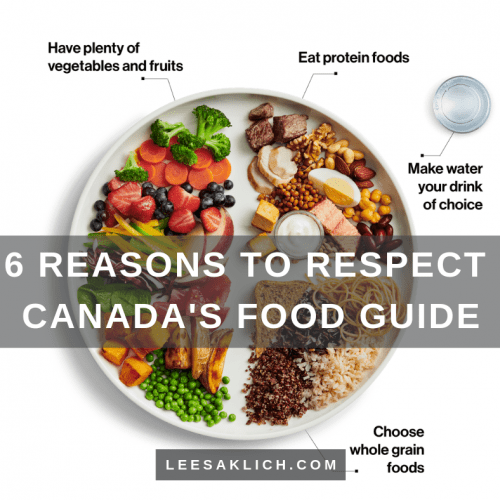 Here are six reasons to respect Canada’s new food guide. In other words, at least on its face (and we’ll dive in deeper below), the whole purpose of revising the Food Guide was for the right reasons. They wanted better recommendations communicated more effectively. Plus, they were committed to being open and transparent about the entire process. No hidden meetings or ulterior motives. They wanted Canadians to see what and how they were doing every step of the way. I’d love to hear your thoughts on this in the comments below! When someone has feedback on something you’ve created, how often do you take a deep breath, remove emotion and personal attachment, and try to objectively hear what that person says? As humans, we seem to be wired to double-down on our position when we feel it’s being “attacked.” Even if the feedback is meant to help and elevate us, we often immediately feel defensive, dismissive, and sometimes even try to prove that other person wrong. It’s natural to try to protect yourself (or your position) when feeling threatened – we all do! (Here is an example of what I mean). While this reaction helps us to survive in times of life and death (literal survival), it will never help us to grow and expand our understanding of a topic. If the feedback is at least somewhat correct, we would be wise to entertain it, even for a short time. But, even if the feedback is total BS and we are 100% correct because we are in fact a real expert, being defensive or dismissive will never help expand our understanding of that person or their intent or their communication style. With this new food guide, Health Canada took feedback (phase 1) and (phase 2) and improved the process they used to create the new version. The food industry – yes, those who often put profits over health – were not at the table to shape this new food guide (I suspect a few of them are piiiiiissssed right now). As a nutrition professional and Canadian it’s SO NICE that the food industry was not invited to the table to shape Canada’s new food guide. That’s called putting citizens over industry profits. The food industry, associations, and companies were allowed to submit their comments as all concerned citizens were. No more. This shows leadership from our government that they see themselves as public health champions (see point #1 above) and that they’re independent from undue industry lobby. In fact, they also included a page devoted to being aware of food marketing. Simply put, they put the health of Canadians first when creating this guideline. Limit foods high in sugars, sodium, and saturated fat. Be aware of food marketing. Again, whether you agree with each of these isn’t my point. My point is that these relevant and important factors that influence what we eat are part of the new guide. Because they should be! Instead of specific “servings,” the new guide focuses on an overall healthier pattern of eating. The Eat Well Plate is so simple, at meals aim for: 50% fruit/veg, 25% whole grains, and 25% protein (dairy, meat, and alternatives). The term “serving” has been identified as an issue for years – it’s not that easy to estimate a serving (we eat on plates, not measuring cups). Plus, the food industry was using the minimum servings to sell more of their products (Don’t forget to have # serving of x today!). There are also a bunch of recipes included to make it easier for people to make their own food. Remember, one of the things that affects people’s health is their ability to cook, so some example recipes can certainly help many Canadians. Plus, they have a few new videos on their YouTube channel. PRO TIP: If you’re a nutrition professional, download the Dietary Guidelines here. 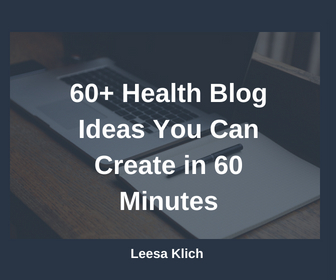 Honestly, one thing I love is constantly learning more about health. New research is consistently published that either supports or refutes what we “know.” I’ve changed my position on topics I “knew” based on new, better quality research (and you can too!). This latest version of Canada’s Food Guide is published, it is NOT carved in stone. Health Canada will update Canada’s dietary guidelines, as needed, to ensure the guidance remains consistent with the latest convincing evidence. You can agree with all, some, or none of the recommendations in Canada’s new food guide – but it certainly deserves way more respect than its predecessors do. It’s simple, easier to follow, includes other factors that affect our food, and excludes industry influence. Have you looked at Canada’s new food guide? Do you agree with it? Does it earn some of your respect? What are your thoughts? I’d love to know (in the comments below)! The Globe and Mail explained some of the new food recommendations here. Dr. Yoni Freedhoff has a great summary of the guide’s health recommendations here. Dr. Freedhoff has an awesome commentary on the greater effects of the new food guide, well beyond that of personal responsibility (I love this one!). Dr. Freedhoff talks about other things in the food environment that should be improved now that the food guide has started leading the way. I’m not crazy that they included margerine as a healthy choice(they should know better by now) or low fat dairy (not better then full fat) . the margerine is the one thing that stood out for me, otherwise, great improvement ! Hey Silvia – I agree, the new food guide is a great improvement. About the margarine, I wonder if they didn’t exclude it because they’ve now banned partially hydrogenated oils from the food supply in Canada — so the really bad options are no longer an issue? Not sure, though. Thx for commenting! Great article as usual! I am really surprised they were able to push this through without manipulation by the usual companies that run this kind of thing. Mindfulness and allowing for more plant-based foods are amazing victories for human health. taking into account different phases of life! I love it. I only wish the US would adopt a similar plate. Ours has also gotten a little better since the 1980s but we have some of the worst health outcomes in the US and a lot of it has to do with lifestyle habits based on high-fat refined foods diets. Hey Zoe! Yes, it’s great that industry was kept arms-length and they included a lot of relevant things like mindfulness and different life phases. One big issue with most (all?) food guides around the world is that the public rarely follows the recommendations. I know this was one thing Health Canada tried to address – make it easier to understand and implement. Hopefully, it will have a positive impact not just here, but anywhere around the world that people access this info online.